Salut mes amis! It's been a while since my last airbrush post and today, I'm introducing a new brand to my blog: Luminess Air. I've been an avid airbrush user for almost two years now, and I can honestly say that airbrush makeup is unbeatable when it comes to achieving a flawless look. Airbrushing smooths out lines and imperfections, tightens pores and brightens the complexion, resulting in a dewy finish that looks like perfect skin. Luminess Heiress Beauty Starter Kit includes 2 .55 oz foundations in one of five color ranges, plus blush, bronzer, primer and glow. Features: One-button continuous airflow allowing for less makeup usage, 70% quieter and half the size of other Luminess models. Boost It! Instant Complexion Enhancer .55 oz -- the first of its kind complexion enhancer than instantly brightens and tightens the skin and can be used alone or as a primer under makeup. Ultra Foundation -- A flawless foundation offering a perfect glow and balanced texture, from sheer to full coverage, for all skin types. Oil-free, Mineral based, alcohol & preservative free. This makeup is long wearing and is perfect for everyday application. Luminess Air offers four types of foundation finishes: Ultra (glow finish); Silk (smooth finish); Satin (dewy finish); Matte (matte finish). Luminess Air foundations are set up by numbers: odd numbers having warm yellow undertones and even numbers having cool pink undertones. All shades must be shaken prior to application and I noticed that the yellow shades are harder to mix than the pink shades and take a couple extra minutes. Eyeshadow Series -- High-performance, long-lasting airbrush eyeshadows. The difference is clear: My skin is even, smooth and glowing. The marks have been erased and the complexion has been noticeably enhanced. 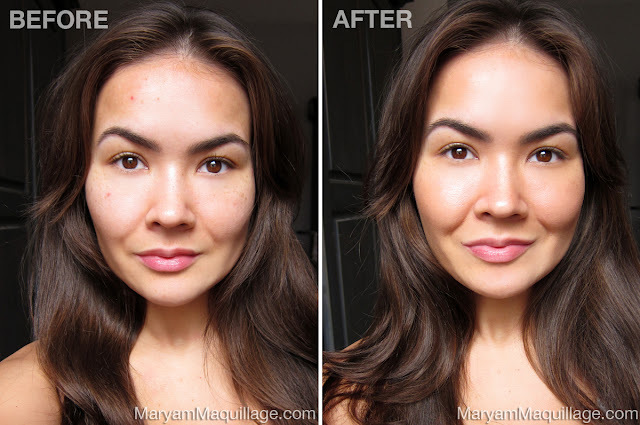 The Ultra foundation feels amazing on the skin and gives a youthful boost with a brightening effect. This is something different for me, as I usually go for matte foundations to cover my naturally oily T-zone. I really like the healthy glow and dewy, flawless finish of Luminess Air Ultra Foundations -- I highly recommend it! The airbrushed effect lasts all day without any fading, creasing or melting. 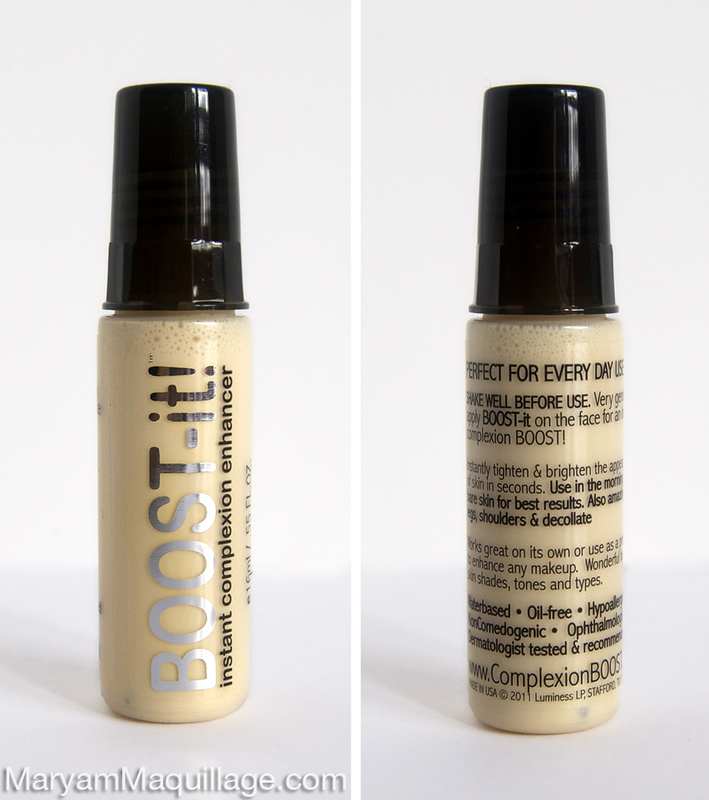 I'm wearing: Boost It! Complexion Enhancer all over the face and chest area followed by Shade 5 (Fawn). I used shade 5 to conceal imperfections by spraying short strokes close to the skin surface, then covering the entire face by keeping the airbrush 6-8 inches away from the face. I used Soft Rose blush on the apples of my cheeks and lips and finished the skin with a few passes of Brightening Glow on the tops of my cheekbones and nose bridge. Easy, no fuss Getting Started Guide -- short, sweet and to the point! Quiet and stable performance of the Heiress Compressor -- I have not tried other Luminess systems, but this one is ideal for every day use. 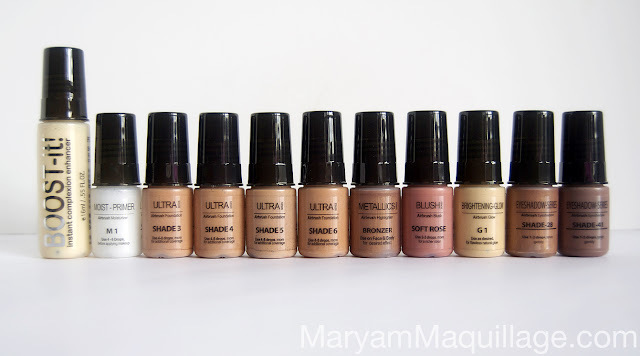 Luminess Air offers FOUR foundation finishes -- I love the extra fine finish of the Ultra and will definitely be trying the Matte next! Boost It! Complexion Enhancer is great for a quick skin pick-me-up and is a terrific stand-alone product that can be used with or without an airbrush. Luminess Air offers two sizes on almost all products, and all bottles include brief instructions or suggested amounts for usage -- this feature comes in very handy, especially for beginners! I don't LOVE the design of the compressor; it reminds me of a soap dish and is a bit outdated, however, the functionality is excellent, so it's a minor visual drawback. The yellow shades separate more than the pink shades, and require longer and more vigorous shaking. This affects time, but does not affect the outcome. Other than the eyeliner and lashes, this eye look is completely airbrushed using Luminess Air. After spraying the skin with M1 Primer, I used 1-2 drops (both eyes) of Shade 41 Espresso Eyeshadow for the crease, shading the outer portion of the eye socket. I used very light passes and rocked my wrist for even application. Next, I sprayed 1-2 drops of Shade 28 Bronzer all over the lids and inner corners. I finished the eyeshadow look with Glow in the inner corners and center lids. Because airbrushing blends naturally, this look was completed in under 2 minutes. My head piece: Caviar Noir Cairo Headpiece (Antique Gold) -- perfect for an Egyptian Goddess look! This is one my favorite pieces from Caviar Noir -- it is so delicate and exotic! To complete my makeup, I went for a luminous, "Golden Goddess" look and used the Metallics Series Bronzer on the frame of my face. I also used the Bronzer as my lip color and contoured the lips with Illamasqua medium pencil in Honour to give it an ombré effect. Airbrushing is easy, fun and results in the most flawless, natural-looking skin -- I absolutely swear by it and recommend it to everyone! Check out Luminess Air & follow the company on Facebook & Twitter. 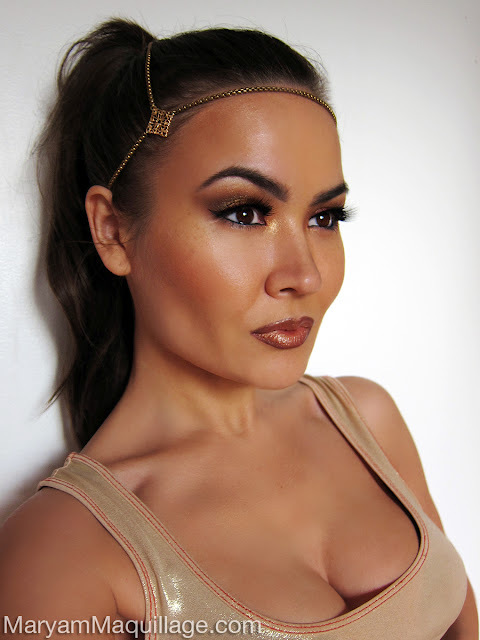 Keep glued for more airbrush reviews and makeup looks featuring Luminess Air & other brands! Loving the bronzed makeup look. It's great for summer. 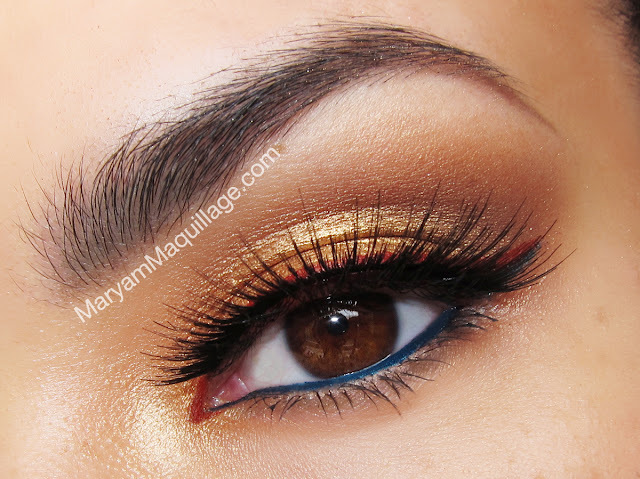 Fantastic look Maryam! I love the double eye liner... Have a great week end. Xoxo V.V. Maryam!! WAUW!! This looks amazing!!! I love how warm the look is. You look photoshopped (in a good way of course), sooo perfect! And I can't believe you did your eyemakeup with the air brush system! Your makeup, as always, looks FLAWLESS! You remind me of a Greek goddess. The only thing I'm missing here, especially with the hair piece, is a long white dress (with a gold belt) that Greek goddesses wear and you're ready to go! 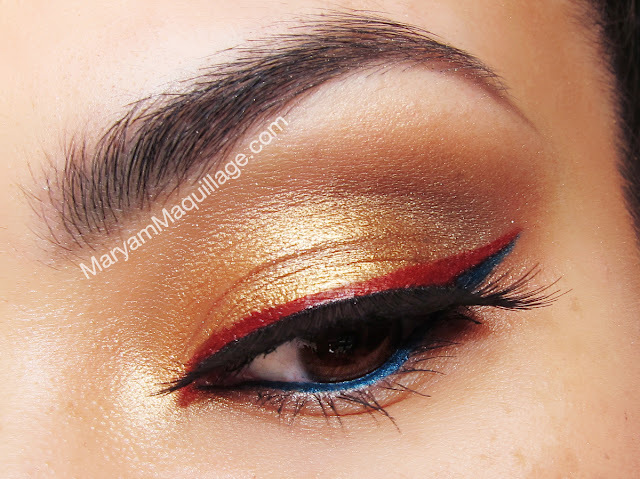 That red and blue eyeliner is just gorgeous!! I love the look its soo beautiful. I actually need your help. With all your experience and expertise on different airbrush systems, I'm sure you would have an answer to my question. Would you able to use any water based foundation in any system meant for water based makeup? For example, Luminess foundation in a Belletto system. I know technically speaking this would void any warranty the system had and I would never try to put silicone makeup in a water based makeup machine. But I was wondering if this would actually harm the machine, I'm hoping you've tried this before and would have an answer. Do you moisturize first? Waiting for my kit.. I'm a first time user. Bright, Textured & Happy -- 3D Nail Art!